Today's snack bento was still on Christmas theme. I used my small square rice mold to make 2 little Christmas presents. I stuffed some tuna mayo inside the rice and decorated it with red and green ribbons made from egg sheet. To get that rubber looks of ribbon, I added 1/2 tea spoon of corn starch (dissolve with 7,5ml of water) in the 2 eggs mixture. Found that tips on my bento book, hope this will useful for others too. I got some new food picks from my Japanese friend and tried the heart shapes picks to pinch the ribbon. And guess what? I got the purple potatoes and decided to use it. Even though the color combination was not so good in the snack box but I'm excited. I was quite surprised when I found the purple potatoes because I never seen that before available in Jakarta. Well, I can say that this was the first time in my life to see that purple potatoes. The color was dark purple inside after I steamed it. Thanks to Sheri for her posting about this type of potato, very useful information. Inside the snack box : veggie puff pastry cut in half, purple potatoes, egg rolls, and broccoli. Look very festive again! I like the presents so much (and they have my favourite onigiri-filling), and your new picks fit perfectly. I should try purple potatoes, too..they look great! Do they taste like normal ones? Looks fabulous! I am going to try the egg sheet trick, it looks so adorable on the packages! This is gorgeous Lia! So creative. Thanks for the cornstarch tip for the egg sheets. I must try it too. I love those presents onigiri soooo much ^.^ thanks for the tips. Thanks for the egg tutorial!!! The colors came out fabulous. 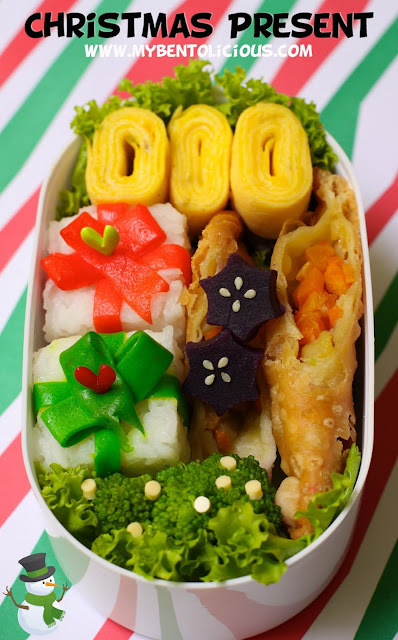 Another wonderful bento! @BentoForKidlet : Love the egg sheet ... you should try it. Thanks a lot Jenn! @Just a MOM : Thanks to you too Lin! wow, i love the present Lia.. thank you for the tip to make the ribbon. I will try it someday..
Hi Lia! So glad to see you found the purple potatoes, just when you were saying you never saw them before! Same with me. I only first saw them this year too... maybe they were always there but I never noticed? Anyway, now you can add the lovely purple color too.. it is a nice contrast here. And I love the gifts. I thought at first it was tofu, 'cuz your rice is so smooth :) Love the neatness of your bento, always ! Send me this present please... :D. Is your potato the purple sweet one? If it's so, I've got it so much in my life LOL. My grandma plants it :D. I recently made it for purple sweet potato balls coated with fresh shredded coconut flesh that my friends like to call it Klepon though the balls I made had no glutinous rice flour addition hehehe. Your bentos are so cute!! !